My friend, Chuck Caldwell, introduced me to Altamura wines. Chuck is one of those rare people from Texas who was visiting and enjoying Napa wines during their early Renaissance in the 1970’s. He has many wonderful stories about some of the valley’s iconic wine makers. I only wish I could have traveled on those old, quiet, Napa Valley roads with Chuck…preferably in a little convertible. Chuck has been a wine mentor for me. He has great recollections of meals eaten and wines consumed with them. His treasured friendships with people like Frank Altamura are just pleasant chapters in Chuck’s storied life. I always tell Chuck, “I can’t wait to hear the story about when you raced in the Iditarod.” To me, Chuck’s done EVERYTHING, so running dogs in the Iditarod doesn’t seem too far-fetched. Of course, there would be wine. 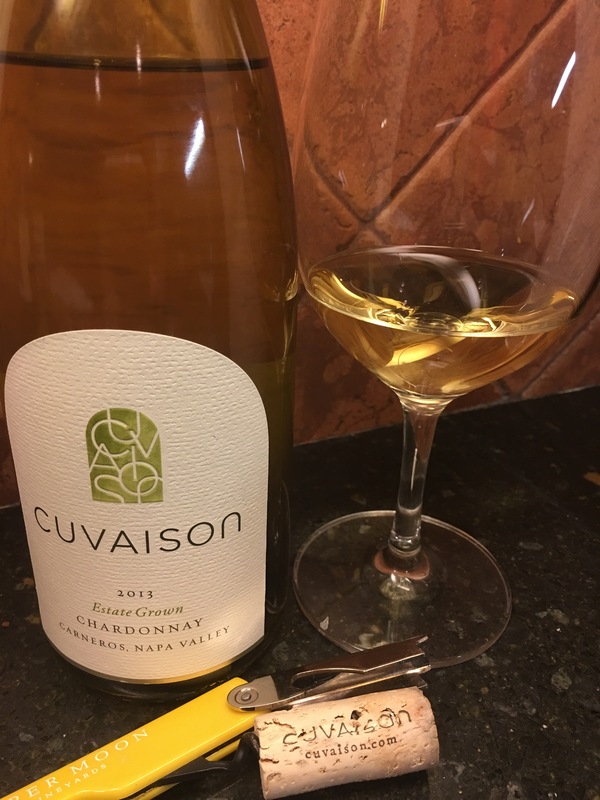 It’s Chuck’s wine stories that have made me eager to reach out and pluck the grapes of all these beautiful wines and learn about the vineyards from whence they came. So back to my serious Red. I was introduced to Altamura wines by Chuck. And on my last trip to Napa we visited Altamura vineyards. The visit, of course, being arranged by Chuck. He’s such a nice guy and we love his wife, Jane, too. The Altamura estate is in Wooden Valley, located down an 11 mile woodsy, hair-pin-curve road running northeast out of Napa proper. Altamura is the only winery in Wooden Valley that is within the Napa Valley AVA. A word of advice, try to avoid this drive with a hangover or sitting in the back seat of the automobile. Trust me. All of us were slightly green on arrival… but we made a splendid recovery!! The winery is much further away from Napa in spirit. The estate and surrounding area is very quiet and pastoral. It truly is a road less traveled. The recently built winery appears as though it was transported from Italy. The building is faced with stones ‘harvested’ from the estate. The big wood doors have an old Italian feel while concealing a very modern wine making facility inside. I didn’t see it completely finished. I think the construction was done over several years… perhaps dictated by the success of their harvests. How very old school!! Luckily, Napa has fairly predicable harvests. During our visiting 2014, we arranged the details of our wine shipment of our wine in a modest, but very practical, portable trailer next door to the winery. It was air-conditioned! No one cared! Altamura Napa Valley Cabernet Sauvignon 2008. A big, cocoa and coffee infused Cabernet. Nice structure. Still with acidity despite its ripeness. Sublime with my Grass Fed ribeye, mashed Cauliflower ‘potatoes’ and steamed broccoli. 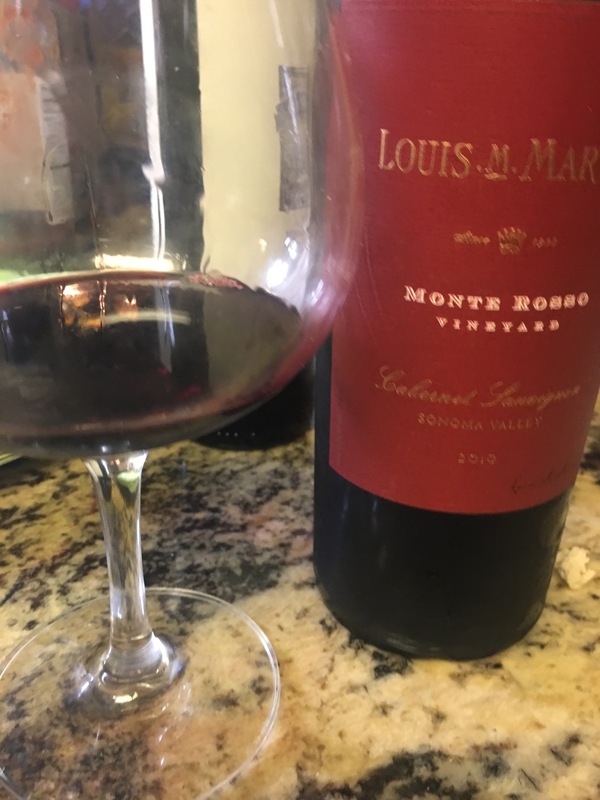 This Cab is lush, sensual, , and a joy to drink. Soft tannins and polite acidity. I am glad I have a few more bottles in the cellar. This Altamura Cabernet has aged well . Although this vintage is no longer available, recent Altamura Cabernet Sauvignon vintages run $85-ish. Altamura also produces several Italian varietal wines such as Sangiovese, Nebbiolo, and Negroamaro. I have been so pleased with all of them. I have also tried their Sauvignon Blanc which is Fume Blanc in style. Well crafted and well praised… as long as you like yours oaked. If you are out in Napa Valley, consider a stop in to Ciccio, the Altamura family restaurant in Yountville. Inside this old Italian grocery store, we delighted in the casual atmosphere, excellent pizza and salads. The menu offers everything from pasta, wood grilled artichokes, to steak. If you live to have a Negroni, the bar offers seven variations. Additionally, all of the Altamura wines are available… and they are very, very nicely priced. Whether you love him, hate him (Why hate anyone? It’s sooo taxing!) or don’t even think about Donald Trump, you have to wonder what the inauguration committee served at lunch!! I did! A relatively inexpensive line-up for the inaugural lunch today as reported by Decanter Magazine. Korbel’s Special Inaugural Cuvée of ‘California Champagne’. Delicato Family Vineyard’Black Stallion’ 2012 Cabernet Sauvignon. Decanter Magazine mentioned that serving ‘California Champagne’ may not endear our relationship with France… but President Trump did say he will put America First! I went to a wine tasting today and I knew I was in for a rare treat because A) it was an Italian wine maker B) hit included Barolo and C) when I went to do a little research in my stack of wine books, I found accolades for Vietti wines. You know the winery is held in high regard when Karen MacNeil includes a multigenerational photo of the Vietti family in her recent edition of The Wine Bible. Honestly, she could have chosen a photo of a Vietti wine label, but instead she has a photo of the whole family. To me, that says something! The Wine Bible also lists Vietta on the list of best producers for both Barolo and Barbaresco (both wines are made from Nebbiolo… in case you were asking) and Barbera (just to confuse you with all these B words). Luca Currado is the current generation of Vietti’s long history of family wine makers . As he spoke, his passion for grape growing, wine making and wine drinking is front and center. He says he was born to make wine and is convinced he was conceived in the wine cellar of the Vietti estate. He is an educated enologist and has tended to his personal and professional wine growth in France and California before taking the reigns at the Vietti estate. Our first wine was 2015 Vietti Roero Arneis. This is a white wine. You COULD think of it as an ugly step sister to the tremendous red wines produced in this area, but you would be foolish. Take another look at this not-so-shy beauty with dry wit and a full body. She carries a gorgeous floral aroma and gives up hints of pear. And all of that body is achieved without the use of oak aging, so her freshness shines through. Arneis plantings were in serious decline, but she is a bit of a come back kid as people have discovered all her attributes!! The next wine to make me really happy was the 2011 Vietta Barbera d’Asti ‘La Crena’. Barbera historically has been the wine of the locals. It is considered simpler than Barolo and Barbaresco, but sometimes simple is pretty darn smart. Barbera grapes have naturally high acidity. The acid helps preserve the wine for aging, helps keep its fresh fruit flavors, and allows the wine to go with almost any dish you want to put on your table. If Barolo is the Wine of Kings and we must prepare a meal worthy of a king, than Barbera is your best friend coming over to join you for a casual meal. ‘La Crena’ is no slouch, however. ‘La Crena’ is a single vineyard Barbera from vines greater than 80 years old. Both French oak and Slovanian oak are used for aging and this Barbera has a richer mouth feel than most I’ve experienced. Delicious. I’m ready for some winter beef stew and root vegetables. Along the lines of Burgundy, the Barolo region is working to determine the best vineyards for its world reknowned Barolo wines. Unofficially, there are about 20 vineyards worthy of being “Grand Cru” and about 40 worthy of being “Premier Cru”. Vietti owns part of 15 top vineyards. Officially? Well, I would imagine making an official determination would be a political nightmare. However, it could happen eventually. The 2012 Vietti Barolo Castiglion is a blend of 11 single vineyards (cru). High tannins and good acidity make for a beautfully balanced wine with flavors and aromas of tea, violets and balsalmic. This wine is a fine example of Barolo. Each cru was fermented separately and aged in Slovanian Oak. Then 5 or 6 are chosen to make the ‘Castiglion’. The other 5 or 6 are blended to make Vietto Nebbiolo ‘Perbacco’, which was not included in the tasting. Our final wine was the 2009 Vietti Barolo “Roccha di Castiglione”. This beautifully perfumed wine had full body and a smooth expression. The tannins were high but they were nicely integrated into the wine so the result was quite harmonious. I was humming!!! Only 300 caes of this single vineyard wine were made from 2009. I felt quite honored to be able to taste it!! These wines are not available at your grocery store or big box wine store. But if you ask Jim Veal about these wines, he has tried them, remembers what they taste like and likely has a few bottles at his house. Yea Jim! I am so grateful that Luca Currado came to share his wine and his passion with us. I hope I have shared his infomation accurately! And, although we didn’t discuss the wine labels, I have to say, I really like them!! Almost as much as the wine… but not quite! Great winery. I’ve been snobby enough to sometimex overlook a mainstream winery’s higher tiered wines. Louis Martini was a lovely surprise. Enjoyed our winery tour and subsequently bought a case. Wonderful wine from a historic Winery. This offering from Sonoma, Monte Rosdo, is very fulfilling. Picked this up at Trader Joes for $17. 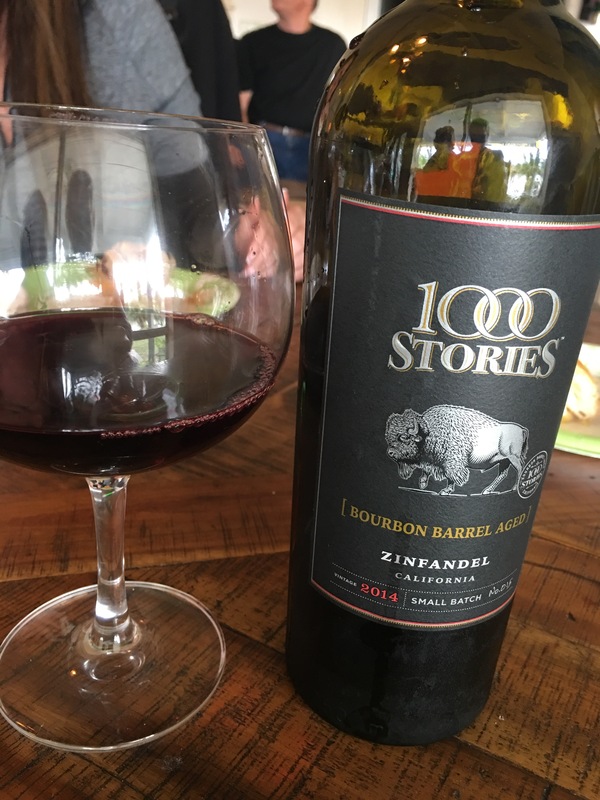 Everyone loves a story and storytelling comes up often in wine marketing. So this wine quickly found its way into my grocery cart. I’m sitting here sharing this with friends as we watch Alabama whip up on Washington State. Laura says, ” Roll Tide! !” (She brought Pom-poms.) Everyone has found this to be an easy drinker….and the bottle is GONE!! If I wanted to buy a ruby, I would want it this beautiful crimson color. Nice tears, barely stained. Aromas of Blackberry, Smoke and Maple Syrup. Flavors of the same plus dark cherry, coffee, black pepper and more maple. 1000 Stories is Aged in French and American oak and batches are then put in used Bourbon barrels. Plenty of happy people here. Fred, I hope they have it in your Trader Joe’s. Sometimes wine won’t cut it and you need to climb into a glass of cold, creamy, comforting Egg Nog–preferably with a good dose of amber liquer. 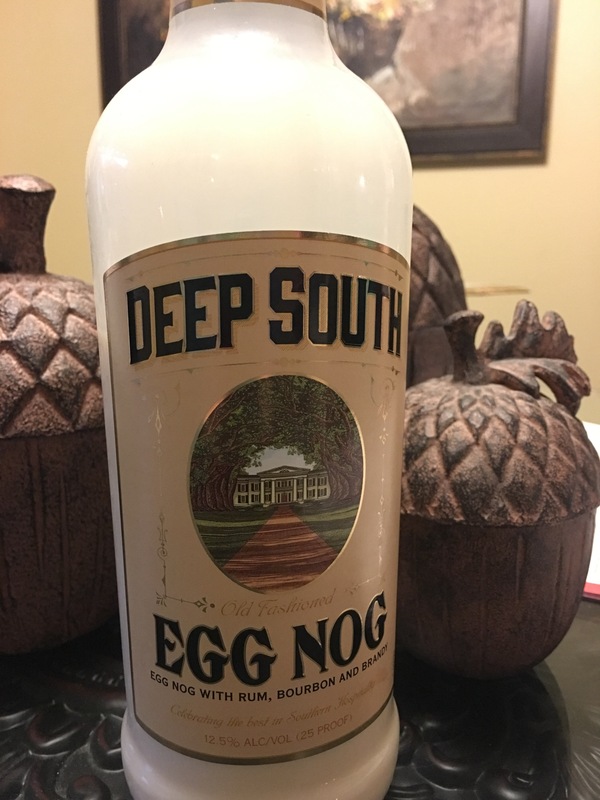 Deep South Egg Nog has got you covered with Rum, Bourbon AND Brandy!! For those who would only drink homemade… good for you. But this only had to have the top twisted off just prior to being poured in my glass. And if it’s not gourmet enough for your standards, I’ll have you know I judiciously seasoned it with Cayanne pepper!! Ya!! Just right to light my Christmas night on fire!! Deep South is 12.5% alcohol. Comes in a 750ml bottle which costs less than $10.